“Godzone” is a colloquial term for New Zealand – shorthand for “God’s Own Country”. It was first used in NZ as the title of a poem about New Zealand written by Thomas Bracken in 1890. In this video, industrial architecture (quaint, but ominous in their decay) vie with striking NZ landscape rendered in virtual 3D. 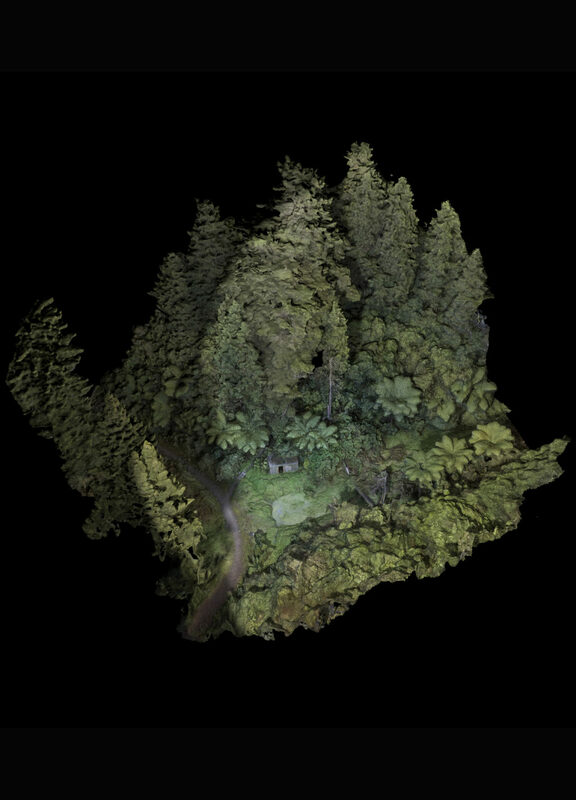 Actual footage is combined with the 3D alternate reality of flyovers of Solaris-like islands such as a factory ruin that segues into a clip of a NZ park built during the work programs of the Great Depression – a unique landscape rich in both Ponga fern trees and redwoods. Part Jurassic Park and part northern California. Brit Bunkley is a New Zealand based artist. International group exhibitions and screenings include the White Box gallery in NYC and Rencontres Internationales Paris/Berlin/Madrid, in Paris at the Centre Pompidou in 2012, the Reina Sofia National Museum, Madrid, Spain in 2013, and at the Gaîté Lyrique and The Haus der Kulturen der Welt, Berlin (2016), Athens Digital Arts Festival and File Sao Paulo 2017 and the Festival Images Contre Nature 2017, Théâtre des Chartreux, Marseille, France. He was an award winner at the Moscow Museum of Modern Art in 2012 at the «Now & After» Festival. He was again included in 2018 as part of the «Now & After» festival. Bunkley exhibited his video, Ghost Shelter/6 at The Federation Square Big Screen, Channels Festival 2017, Melbourne. He completed a video installation in 2017 in collaboration with the sound artist Susan Frykberg at the Sarjeant Gallery, Whanganui, New Zealand and a video/sculpture installation at Auckland’s Te Uru public gallery later in 2017. He will have the video, Ghost Shelter/6 screened at Oberhausen Short Film Festival, Oberhausen, Germany in 2018. Additionally he will have a solo show comprised of that video, related videos and sculpture at the Sarjeant Gallery, Whanganui, NZ June- August 2018.